Due to the success of the Carruthers Shield, domestic matches have had to be arranged and I would like to thank Mike Gouldingay for his work with this difficult task. Tenby were 22 points behind Whitland, but had 3 games in hand, and last Saturday, played against the league leaders at their own ‘green’. Therefore the task for Tenby was to win two of the three games in hand that were played before their visit to Whitland. Tuesday, 24th July, Tenby entertained Haverfordwest Castle and enjoyed a comfortable 45 shot win although this was due to two rinks winning by large margins and only 11 points secured for the nights work. With several first team players absent, the junior players had an opportunity to shine and Arron Lloyd was the pick of the bunch by playing superbly for Andrew Muskett. The Thursday, Tenby then entertained Haverfordwest and it was ironic that although the winner margin was lower than Tuesday night, 28 shots, the maximum 14 points were secured as Tenby won on all 4 rinks. Arron Lloyd retained his place in the team due to his performance on the Tuesday evening. With a lead of three points and still that important game in hand, Tenby fielded their strong Carruthers side, but due to the success of John Roberts in the Saundersfoot Open, Arron Lloyd features for the third successive game and played with Phil Carpenter. Always a lively encounter, the Whitland team proved to be a hard team to break down, but with Tenby knowing that a win would virtually seal the league title for the third successive year, they had a comfortable win by 23 shots and won on three out of the four rinks to seal a 12-2 victory. Craig Guymer’s rink was always in control against Dan Jenner, the Whitland Vice-Captain and took an early 8-0 lead after 4 ends and finished the match with top rink spoils, 25-12. Pat Currie always had the edge on Whitland Captain, Glyndwr Thomas and won 21-17 even though they lost the last 3 ends. The undeafeated back end combination of the Double PD’s backed up with the ever impressive front end combination of Spencer and Richards came up against the top Whitland rink but were in total control and also ran out comfortable 20-12 winners. Tenby’s sole defeat at the hands of Steve Reese, by 2 shots, gave some consolation to the Whitland team. Trailing by 4-13 after 12 ends, the rink rallied and came back strong to lead at the 20th end by one, but for a near miss by Phil Carpenter with the last bowl of the match victory would have been their’s. Following from this victory, Tenby now have a lead of 13 points and still have a game in hand. They have to play Pembroke Dock and Saundersfoot away and Milford Haven home and now require 15 points if Whitland win their remaining two games by the maximum margin. With the vast superiority in shot difference, 14 points will be enough. Congratulations to Whitland for once again pushing the Welsh Champions in the domestic league, but Tenby have once again proved to be Pembrokeshire’s best and congratulations to them for another successful campaign, barring a huge slip up. Preview – Tenby vs Glyncorrwg – Welsh Club Championship Quarter Finals. Tomorrow, at 3pm, the Tenby team entertain one of the top sides in Welsh Bowls, Glyncorrowg from, last Pontrhydyfen, the Afan Valley. The path to the quarter finals has seen the Valley side having a bye in the first round while Tenby easily defeated Caerleon away from their Sutton Street Headquarters. The second round, Tenby travel to Morriston, who had earlier defeated former winners, Victoria (Swansea) and Old Landorians (Swansea). Although on paper a very tough test for the ‘sharks’ they came away with a comfortable 29 shot win. Glyncorrwg accounted for Brynhyfryd (Llanelli) former 4 times winners by 13 shots away from home (79-66) which shows that they can produce performances away from their home ground. Tenby produced the performance of the round in round 3 (last 16) beating the most successful side in the history of the competition, Pontrhydyfen, by a huge 43 shots and winning on all 4 rinks. Not to be outdone, Glyncorrwg defeated a very strong RTB Ebbw Vale side, which included several current Welsh Internationals in their side, including one of their former players and current Welsh International Skip, Jonathan Tomlinson. Also in the Ebbw Vale side was the World Indoor Singles finalist, Stewart Anderson which proves that the result, especially away from home for the second consecutive round, indicates that the Afan Valley side mean business and are a very big threat to Tenby’s hold on the Shield. 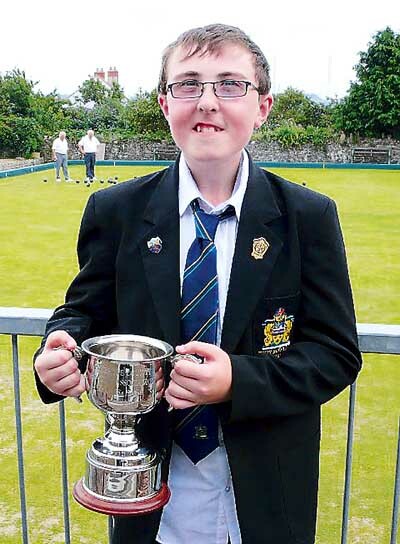 Stars of the Glyncorrwg side has have to include, Ross Tomlinson, who together with Geoff Simon and Neil Taylor won the British Isles Triples only a few months ago, and Ross’s father, John Tomlinson, a former Welsh National Singles Winner. However, this side has great players in all positions and Tenby have their work cut out to reach their second successive appearance in Llandridod Wells. The match has been sponsored by Bet Fred Bookmakers, and the Tenby Club are very grateful for their support and the club welcome local supporters which I am sure will witness a great match between two evenly contested teams. There is a team practice scheduled for Friday night and every player who has not featured in Gold Cup week is expected to attend. After the successfully navigating past Caerleon and Morriston in the first and second round of the Carruthers Shield, the Tenby sponsored Layton and Co solicitors and Chandler Rogers Estate Agents team played at Sutton Street to face the most successful team in the History of the Carruthers Shield. 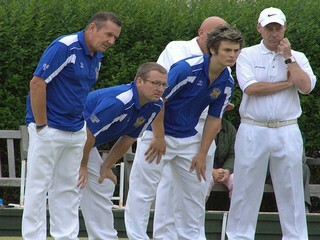 Pontrhydfen have won the title 7 times and have won the event 6 times since 1999 and lost by 1 shot in the 2007 final. Pontrhydfen is a small village in the Afan Valley, in Neath Port Talbot county borough and their side is littered with Welsh Internationals, World and Commonwealth Champions and Multiple Welsh and British Isles Champions. 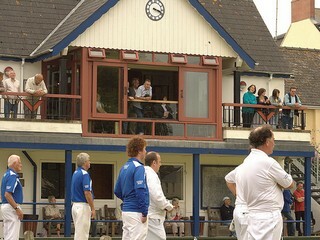 This game was the sternest test that the Tenby Club have faced in their entire history and Pontrhydfen went into the match as firm favourites to end Tenby’s tenure as Welsh Club Champions. At 5 ends, Tenby were down by 6 shots (12-18) and the task facing them was beginning to show as Pontrhydfen started to settle into the match with their international players showing their skill by quickly adapted to the Tenby ‘green’. Tenby rallied superbly over the next 5 ends and led by 6 by the 10th end (35-9). From there, Tenby took control of the match by taking the challenge to the Afan Valley team and led at 15 ends by 28 shots (66-38). By the time the 18th end was recorded, the match as a contest was over as Tenby extended their lead to 36 shots and upon the conclusion, a victory of 43 was secured. Rink 1, saw Phil Carpenter take on multiple commonwealth games medal winner David Wilkins. David was superb for the away team and showed just why he has attained over 120 welsh international caps. The match was close up until the 10th end at 8-8, but then the Tenby rink, with newly crowned Pembrokeshire Pairs Ch ampion, Jonathan Webb in great form as was Tenby’s former Welsh International, Phil Carpenter, won the next 5 ends to lead 20-8. The final score of 22-14 could have been by a bigger margin if it was not for the skill of David Wilkins. Pat Currie team up with Welsh International John Roberts, and at five ends they could not get on the score board and trailed 0-7 to another Welsh International, Barrie Evans. The rink rallied with Neil Dickinson having a superb game. Neil totally outplayed Ben Thomas (back to back indoor singles champion 2008 and 2009) to help the rink take a 8-7 lead by the 10th (end). A count of ‘5’ broke a close scoring match and after the 18th end, the Pontrhydfen team conceded defeat as the rain came in, 20-12. Junior Internationals Luke and Craig Guymer formed, once again, a great ‘rink’ partnership with the excellent Luke Rees and Mike Jackson both in great form on Rink 3. They took on former World Champion, William Thomas and like the result on ‘rink 1’, the match was evenly poised at 10 ends, with the home rink behind 7-8. A strong finish from ends 13 to 21 saw them win 20-13. Paul Diment played on Rink 4 against Welsh International, Jeff Wilkins and at 5 ends the strong combination of Diment and Pembrokeshire Singles Champion, (Peter) Day trailed by 3-5. A change in tactics which involved the front end of David Spencer and Joe Richards changing ‘hands’ (not literally!) reaped dividends and by the 10th end, they had built up a lead of 6 shots (12-6). David Spencer, in my opinion, played his best ever game for Tenby and was backed up by the excellent Joe Richards. The rink at 15 ends had now raced into a 23-6 lead and a count of ‘6’ on the 18th end saw a huge win of 31-11 being recorded. In my opinion, this was the best ever performance by a Tenby team and could even rival the historic events of last August when the Welsh title was won for the first time. It is always hard to defend a title as teams will always be better prepared and determined to be the first to defeat the holders. Considering the strength of the opposition, the score line has no doubt sent a message to Welsh Bowls and after the result, Tenby have been installed as 6/4 favourites to retain their title. Next up will be another Afan Valley team, Glyncorrwg. Although they have not got the pedigree of Pontrhydfen, they are an extremely skilful side and Tenby have a hard task on their hands to progress to the semi-finals. Obviously home advantage is a great boost at this stage of the competition and with the match being held at Sutton Street I do not see anything but a win. However lessons have been learnt from our earlier defeat at home to Whitland and complacency will not be an issue for this match. I reported after the Whitland defeat that it could very well be a result which focused us and so far I have been proved, like selection, right(! ).